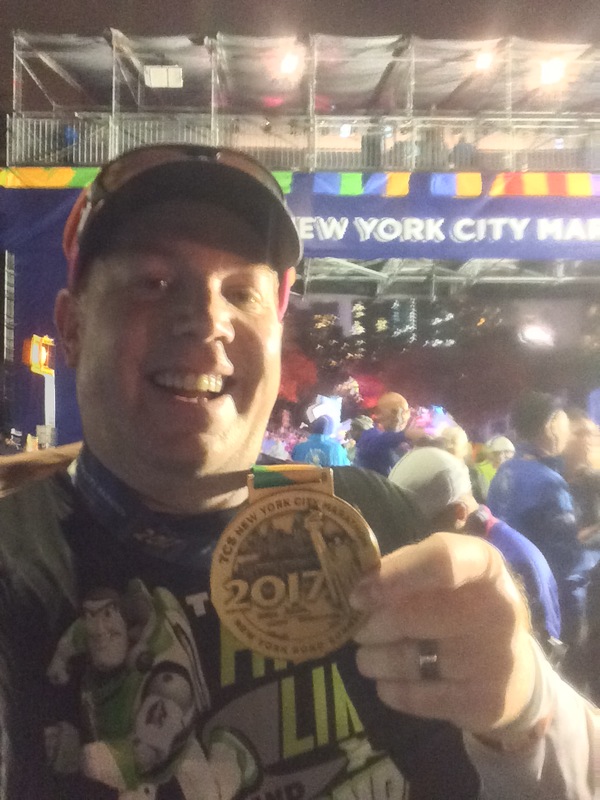 The title of this blog is Why I runDisney. So, I thought it would be quite appropriate to talk about that and why I have given my blog this name. 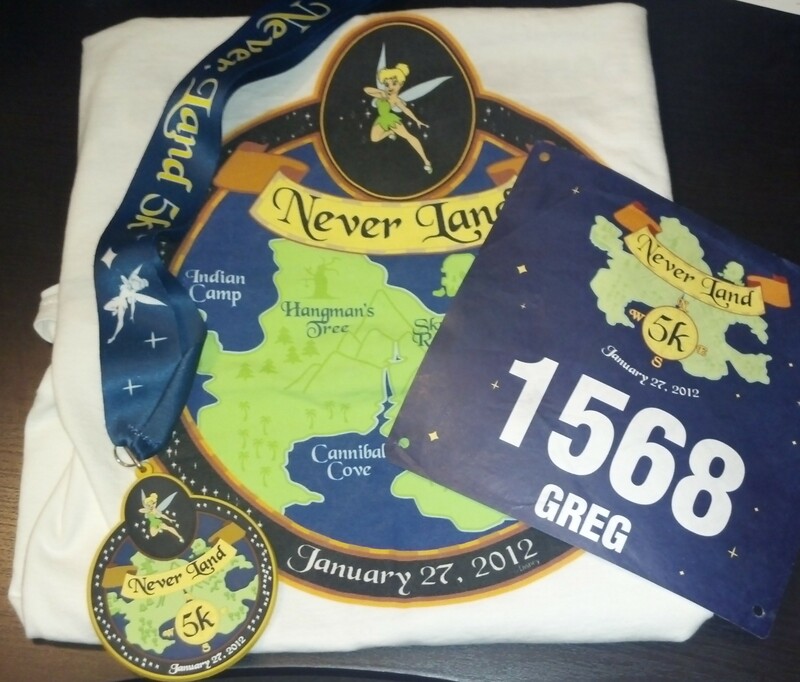 My journey into running began with the Inaugural Neverland 5K. At the D23 Convention in 2011, I saw an ad for the upcoming, and Inaugural Tinker Bell Half Marathon weekend. I regularly read Mice Chat.com. On it, I have read trip reports of people who came out to run in the Disneyland Half Marathon. While the half marathon distance sounded like too much for me, I thought I could work my way up to a 5K. So, when I saw that there was a 5K, I checked out the runDisney web site and signed up. At work, I had seen advertisements for a Couch to 5K program on Active.com. So, I started with that. In July of 2011, I became a member of LA Fitness in Pasadena and was looking for something to keep me going towards my weight loss goals. This 5K idea sounded good. I would follow the program running on the treadmill at the gym in addition to other exercises. It sounded all too good. I was diligent at my training for August and the first half of September. However, the combination of fall classes at Pasadena City College, getting ready to move offices at the end of 2011, and my father suffering a heart attack all combined to derail my training. Add to that, I was rehearsing to sing in the Disney Cast Member Choir for the Candlelight Processional at Disneyland and all the other Christmas activities and before I knew it, January 1st had rolled around and I hadn’t trained for a month and a half. So, with the dawn of 2012, I dialed back in to the training and did what I could to get ready. 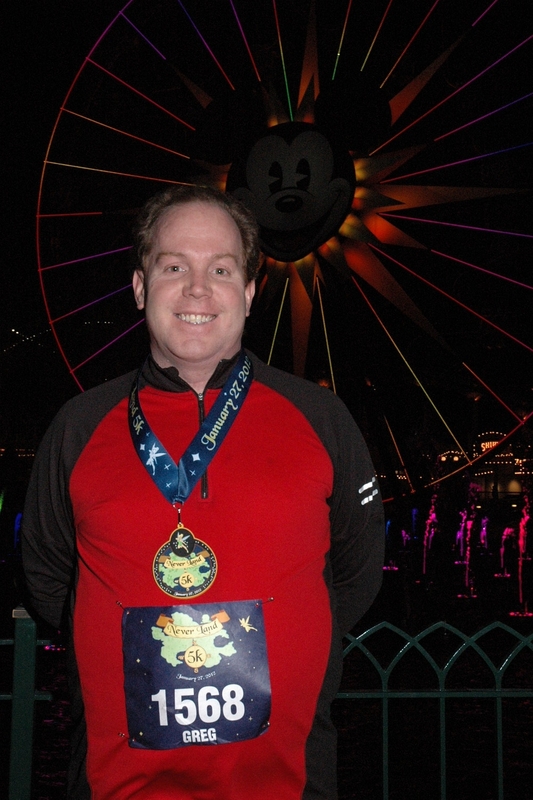 On January 27, 2012, I entered my first runDisney race. The Neverland 5K started at 11pm inside of Disneyland. My wife and I stayed at the Hotel Menage because I did not want to be driving home after running so late. On the treadmill, I was running 5K’s in 38 minutes. So, I was hoping to finish in 45 minutes. After all, I had never trained outside. Upon arrival, I was instantly excited. They had a DJ playing tunes to keep everyone’s energy high. It was a really festive atmosphere. They brought out a trumpeter to play the national anthem and we were off. I was in the third group of people to start. It was so exciting! The first part of the race was crowded. I didn’t even bother looking like I was running. By the time we got backstage, we finally found room to run and I did. Running through my favorite theme park (Disneyland) was so much fun! They had characters and parade floats set up for pictures. They even were allowing pictures backstage. As a Disney cast member, I knew that this was a big “no, no” for us. I so wished that I brought a camera. Anyways, the second mile of this trek seemed to go on forever. However, the last mile went by superfast. I finished in around 36 minutes! With all of the excitement, I was hooked. This running thing was kind of cool. Check out the official runDisney video highlights. I now knew I could do 5K’s. So, I signed up for a few more. My last 5K in 2012 was my personal best. 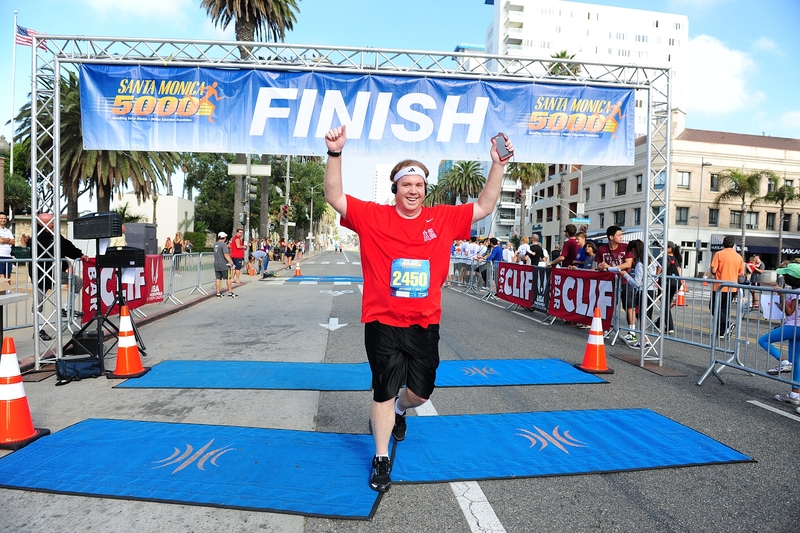 With the 5K distance under my belt, I took a leap to sign up for a few 10K races in Cypress, Santa Monica, and at Universal Studios. By the time I got around to training for the Santa Monica 10K, I was finally training outside and using an app for my phone called Map My Run. This was a cool app because it gave me the information that the treadmill would give me like speed, distance, and time while I was running. It was cool enough for me to be able go as fast as I was going at these distances. I’m not that fast. But, for me to complete training runs of 6 miles at between 11 and 12 minutes per mile on average was amazing. I was fully intent on signing up for the 5K race at Disneyland over Labor Day weekend 2012. However, while waiting to see if anyone would join me, I ended up missing the sign up by one day. Ugh! I was pretty bummed about missing out. So, I wanted to make sure that I signed up in time for the Neverland 5K again. 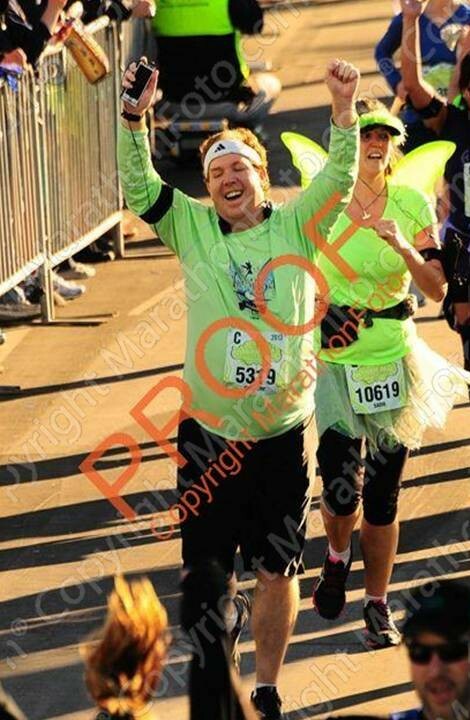 When sign ups came around for the Tinker Bell Half Marathon Weekend 2013, I not only signed up for the Neverland 5K, but took a leap of faith and signed up for the half marathon as well. I finished! WOW! I finished 13.1 miles! At the end of that, I was hooked. I felt like a completely different person. I wanted to be a runner. All I could think about that night is how much faster I might finish the Disneyland Half Marathon if I did proper training. Two days after finishing my first half marathon, I signed up for the Disneyland Half Marathon and the 10K. My wife had talked about doing the 10K after finishing her first 5K. So, when I logged on to the runDisney web site the first day of registration, I was stunned to find out the new challenge (Dumbo Double Dare) was already sold out. The 10K was filling up fast. So, I checked to see if I could pay for our entries, texted the wife to see if she really wanted to do the 10K, and signed up. So, I’m doing the distances for the Dumbo Double Dare without the extra medal. Why do I like the runDisney races best? Because they are the most organized and fun races to do. I’ve done other 5K’s and 10K’s. No other course had the same numbers of people along the course cheering you on as the Disney races. No one had the same on course entertainment. Also, the Disney finisher medals just are cooler to this Disney fan. Plus, it is so much fun to run in the parks. I’m seriously wishing it was January already to run through the theme parks at Walt Disney World. So, the runDisney races are just a natural fit for me. I will run other races because they are fun as well. However, nothing matches the fun of a runDisney event. If only I lived closer to Florida, I’d probably run in more of them. Since I’m a Southern California boy, I will have to settle for the two at Disneyland with occasional visits to Walt Disney World when money permits. great post!!! I have ran most of the Run Disney races in Walt Disney World and each race was a memorable one I will never forget! I wish I lived closer to Walt Disney World. They have so many races to choose from. We need more out here at Disneyland. I’m looking forward to my first Walt Disney World race in January. I’m running the 10K and my first full marathon. Can’t wait! yes there are a lot more races here than over there…I will also run those two races in January! im super excited I can’t wait!! My wife will be doing the 10K with me in Florida. I’ll be doing the Marathon solo. I have no idea what to expect from my first race in humidity. It doesn’t get very humid here in LA. Part of the reason I chose not to pursue the Goofy Challenge or the Dopey Challenge is because I’ve never run in humidity. It’s better to play it safe and have an enjoyable time at WDW than to push myself beyond what I can do and miss out on some fun. Good luck to you as you train for the marathon. I won’t begin to focus on the marathon until after the Disneyland Half Marathon. runDisney is the best…love them! :0) Great story, so glad you were able to complete the Tinkerbell Half! Thanks for the comment. I’m glad I finished the Tinker Bell Half as well. It changed my life! I’ve got to give my wife credit for that one, though. If not for her, I would not have even tried. It’s amazing what can happen when we try. We are capable of so much more than our minds can conceive.